Roses, the traditional flower of love, receive a modern twist in this imaginative bouquet. 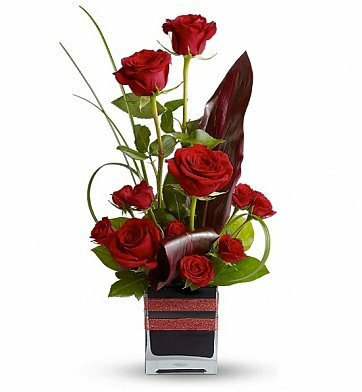 Delivered in a contemporary glass cube vase decorated with red ribbon, the bouquet makes a special statement of love and passion. Lily Grass, Lush Greenery and more. Standard Arrangement Measures 12" x 11". Rose Passion Bouquet is a hand delivered gift. These gifts are delivered by one of our local design centers located throughout the United States and Canada. Same day delivery is available for most gifts when ordered before the cutoff time. The cutoff time for Rose Passion Bouquet is 10 AM in the recipient's time zone. Beautifully assembled. Timely delivery. Spot on service. Highly recommended for your floral needs! The recipient was absolutely blown away. I purchased this as a gift for my new love. She could not stop talking about how beautiful the arrangement looked. Sadly, since I am three states away I have not been able to see it myself. The flowers arrived in a very timely manner and they looked great. Thank You for making this a very smooth transaction. The flowers were perfect and the receiver loved them. I bought the gift from Brazil, without any knowledge of the company, and the flowers were delivered as requested. Company of great reliability. Thank you. Almost exactly like thie pic. The flowers were perfect. But did not get that vase. Bought this for hubby for our 24th wedding anniversary. He was pleasantly surprised. The flower was delivered and looked just like the image on the website. I would have given 5 stars except the arrangement was delivered very late in the evening. Very Nice turned out just like the pictures!! This was a gift for my daughter who loves roses, but is not traditional. This arrangement appeared to be contemporary and I was hoping it would be so in real life. It was perfect! and she loved it. she enjoyed the bouquet and when I saw it in person it was extremely flattering yet modern to see.